The Skip . . . 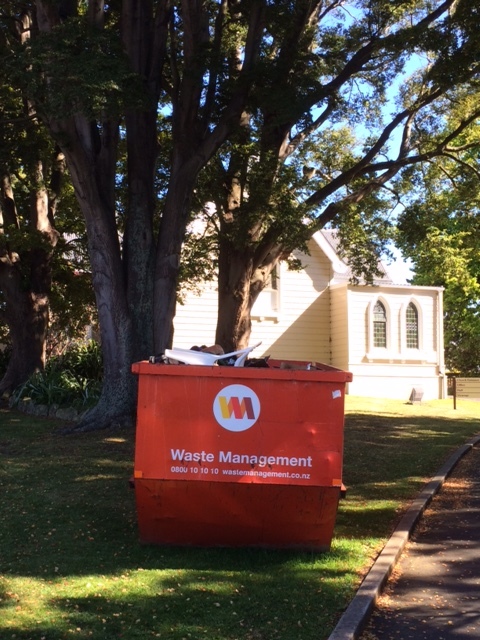 Approaching Church this morning I am confronted by ‘Progress’ – The Story has moved on. Amidst that which once formed us, Trees and Temple, stands the New Ikon of our Age, the very Goal of Progress! Our New Improved version of Heaven . . . The Skip! Yesterday I had to endure once more what is one of the more Soul destructive of happenings, the visit of a Technician. Soul destroying for it further wrote my own capacities, my own agency out of the picture. That is, there was once something which I could do myself, but now, thanks to Progress, I find myself unable to do. (Not I must add due to the increasing crankiness of my joints – for all of us, increasing age means a decline in our physical capacity, and thus physical agency in the world). The Technician is the great Manifestation of Progress, for his appearing reminds us that Progressively we lack meaningful agency in the world of Progress. He comes to put us in our place as passive consumers of things. This is a frequent occurrence in these blessed days of Consumer bliss. I now no longer can fix my own car, even bicycle gears are getting ‘a but tricky’. For things have Progressed – which obviously means that they are better, no? Change a plug??!! Why? When we have moulded plugs which are so bound to their ephemeral consumables, that even they, which used to be removed before disposal, now go happily to that place of oblivion. Increasingly unusually, there was a gleam of light in the visit, a sign that ‘The Old Things’ had not entirely been forgotten. Apparently The Technician could obtain a new element!! and, what is more, at a cost less than a replacement cooker . . . or at least he thought so . . . So for a time, the cooker (by now an almost prehistoric 5 years old – what ARE we thinking hoping that it might be repaired???) was spared from that Modern Nirvana, The Skip, even if that were not to be the case for the element. I gather that Progress now is becoming more explicit in its goal, hence the new prophetically named iPhone ‘Ex’. This most expensive ever (read ‘for the time being’), has sold out almost overnight. At the Cutting edge of Progress, iPhone ‘Eyeye Exes’ will start to gather dust. Like the elderly in rest homes – or as one Aged Care ‘Manager’ once named them, ‘End of Life facilities’ – they will be forgotten and wait their turn ‘to Pass’, to The Skip . . . The myth of Progress is probably the most destructive we have ever known. It hides itself in many guises, some of them Religious, but all religious. Out of the ‘planet’ everything is dug, and then Progresses to end up in a hole in the ground – Everything. Phone, element, agency, person, Skipped as we Progress ourselves to The New, The Improved! Why, even the Skip comes with doors nowadays, to ease our passing . . .
All the questions, testing Jesus, trying to trap him in terms of the Law and one last time they try. ‘One of them, a lawyer, asked him a question to test him. “Teacher, which commandment in the law is the greatest?”’ Which commandment . . . which reveals their problem . . . you see, for the Pharisees there were 613 commandments in Tanakh, The Law and The Prohpets – 613!! Indeed there are! And the Pharisees in their concern not to break one had added lots of interpretative laws as well – for example there were 39 specific types of work forbidden on the Sabbath . . . or the question of the neighbour – Who is my neighbour – a matter of vigorous dispute amongst the various schools in Judaism – especially for the pharisees who wanted desperately to preserve National Identity by keeping anything, or anyone unclean out. They strongly believed that as long as they did this, they were safe from God’s judgement and that therefore their uneasy peace with the Romans would be sustained. If we just keep the Law properly then we won’t end up in exile like our ancestors . . . Keeping in with the occupiers, especially when the occupiers made sport of crucifying people . . . who really can blame them?? So, which commandment, because there are so very very many – like a world of distractions, like poor Martha . . . and Jesus response is like that of the prophets before him is Simple. “’You shall love the Lord your God with all your heart, and with all your soul, and with all your mind.’ This is the greatest and first commandment. You shall not render an unjust judgment; you shall not be partial to the poor or defer to the great: with justice you shall judge your neighbor. You shall not go around as a slanderer among your people, and you shall not profit by the blood of your neighbor: I am the Lord. I must admit I shudder when I hear that one – how is it possible in the world to day to make a profit apart from by the blood of our neighbours? You shall not hate in your heart anyone of your kin; you shall reprove your neighbor, or you will incur guilt yourself. You shall not take vengeance or bear a grudge against any of your people, but you shall love your neighbor as yourself: I am the Lord. When we hear these two commandments we can end up with a bit of a conundrum, as if we have to choose, and the choice seems to be a tricky one – for if you love God with all your heart and all your soul and all your mind – what is left for the neighbour? But the answer is given in that repetitive strain – ‘I am the Lord’ It is in the face of God – with our hearts and minds and souls set upon him, that we learn to love our neighbour as our self – Loving Him with all we are and thus knowing ourselves to be loved we are set free from our own concerns. Looking always to God, like the Psalmist, whose delight is in the Law of the Lord and on his law he meditates day and night, our lives bear the fruit of the Life of God whom we love . . . The other day I was pondering how to express this in practise, this Loving God with all we have and are, and how it led us to the Love of neighbour as ourselves. For surely if we Love God in all and above all and through all, we shall love truly, and with Good discernment and judgement . . . After all, we have our mind on so many things . . . Loving God, Loving neighbours – as if God and Neighbour were different things in a world of things – and I was reminded of Magic Eye pictures. Do you remember them? [Here is one] Can anyone see the picture?? The trick, so I am told, because I have never been able to do it, is to focus BEHIND the picture. To bring your gaze to rest at a point beyond . . . in heaven you might say . . . and when you do that, Then the picture leaps into life. Fixing our heart and mind and soul upon God – letting our gaze rest on Him – we then see the World in all its clarity – Resting our gaze on God, God’s image is now not just some useful slogan but something we truly discern – and I must say we genuinely do not merely ‘think of the world differently’ – because as modern people, this is what we think ( 🙂 ) it is all about, no we truly begin to See differently – we receive the world differently as we open our eyes and let them rest on God. it is the true meaning of the contemplative life, not to hole ourselves up but to learn to rest the gaze of our heart and soul and mind on God and then to use our strength as we truly encounter our neighbour . . .
And it is . . . ‘On these two commandments hang all the law and the prophets.” The Pharisees were afraid above all that Jesus had come to trash everything – after all he seemed to ignore the Sabbath – they were afraid that his coming would so stir the crowds that If we shall let Him alone like this, all will believe in Him, and the Romans will come and will take away both our place and nation. – that he had come to abolish the Law and the prophets – But Jesus says , ‘Do not think that I have come to abolish the Law and the prophets, but to fulfill them. At the end of all the questions – Jesus finally draws their attention to the Whole Law, for He is the fulfillment of that Entire Law – Loving God utterly, only doing what he sees the Father doing – and doing for his neighbour what as he would want them to do for him, laying down his life for them – befriending them, neighbouring them. And so once more he asks? Do you see? Now while the Pharisees were gathered together, Jesus asked them this question: “What do you think of the Messiah? Whose son is he?” They said to him, “The son of David.” He said to them, “How is it then that David by the Spirit calls him Lord, saying, ‘The Lord said to my Lord, “Sit at my right hand, until I put your enemies under your feet”’? If David thus calls him Lord, how can he be his son?” . . . Whose Son is He? Do we see?